First Appearance: Flash (vol. 2) #71 (Dec. 1992): "Nowhere Fast"
Curiously, ComicBookDB.com lists The Alchemist (Curtis Engstrom) as a character in America vs. the Justice Society #3 (Mar. 1985), although this character supposedly was not introduced until The Flash (vol. 2) #71 (Dec. 1992). 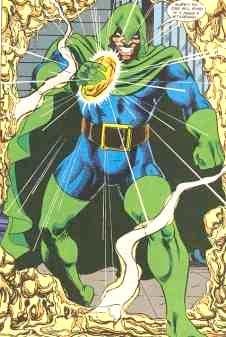 Perhaps "The Alchemist" in the America vs. the Justice Society story is a different character? Or perhaps this is an indexing error. America vs. the Justice Society #3 (Mar. 1985): "Hostile Witness"
Flash (vol. 2) #71 (Dec. 1992): "Nowhere Fast"